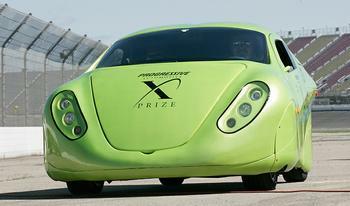 PLAYA VISTA, California, September 22, 2010 (ENS) – Two automotive engineering teams from the United States and one from Switzerland have won the Progressive Automotive X Prize and will share the $10 million purse for their achievements. The three winning teams have each built a production-capable, fast, safe car that travels more than 100 miles on the energy equivalent of one gallon of gasoline. The X Prize Foundation and Progressive Insurance Thursday named the winners – the fastest-performing cars that satisfied safety and emissions tests and exceeded 100 MPGe. The mainstream class requires a car to have four wheels, seat four passengers, and demonstrate a 200 mile range, and offers a $5 million prize to the winner. 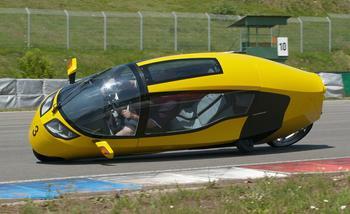 Each of the two alternative classes requires a car to seat 2 people and go 100 miles on a single tank or charge. The winner of each class will receive $2.5 million. Edison2, a Lynchburg, Virginia, automotive innovation company led by Charlottesville developer and racing entrepreneur Oliver Kuttner, was presented the $5 million prize at the Progressive Insurance Automotive X PRIZE awards ceremony at the Historical Society of Washington, DC. 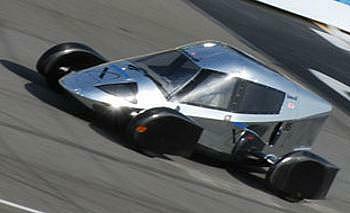 Edison2 won the “mainstream” class with its Very Light Car, a four-wheeled, aerodynamic vehicle that seats four. It lives up to its name with a curb weight of only 830 pounds. The Edison2’s innovative small displacement engine runs on E85, a blend of 85 pecent ethanol and 15 pecent gasoline. The car achieved the energy equivalent of 102.5 miles per gallon of gasoline and the lowest drag coefficient of any car with four wheels ever tested at Chrysler Proving Grounds. Li-ion Motors Corp. of Mooresville, North Carolina, earned a $2.5 million prize with a win in the “alternative side-by-side” class for its two-seater battery electric vehicle, the Wave II. The car is built on a lightweight aluminum chassis and weighs in at only 2,176 pounds, despite the weight of its powerful lithium ion batteries. Its distinctive look features an aerodynamic body that encloses all four wheels. Featuring a 14.7 second zero-to-60 mph acceleration time, the Wave II achieved 187 MPGe and demonstrated a driving range of more than 100 miles. X-Tracer Team Switzerland from Winterthur, Switzerland, won $2.5 million in the “alternative tandem” class with the E-Tracer. This tandem two-seat design is essentially an enclosed all-electric motorcycle that deploys two extra outrigger wheels at low speeds to stabilize the vehicle. At 1,436 pounds, the E-Tracer is able to deliver over 100 miles in range. The vehicle achieved more than 200 MPGe, the greatest fuel economy reached by any entry in the X Prize competition and achieved a zero-to-60 mph acceleration time of just 6.6 seconds. The Knockout Stage of the X Prize competition ran June 20-30 at the Michigan International Speedway, with entrants in all three classes put through technical inspections, dynamic safety tests and efficiency and range requirements. The finals were held July 19-30 also at the Michigan International Speedway. During the finals, 15 vehicles underwent a series of on-track challenges designed to test efficiency, range, durability, handling, acceleration, braking and emissions in a real world environment. This intense set of trials ended the competition for six vehicles, thinning the field to nine contenders. In August the top finishers went through validation testing under controlled laboratory conditions at the U.S. EPA and Argonne Labs in Ann Arbor and Chicago to verify each vehicle’s performance. The U.S. Department of Energy was involved in the Progressive Automotive X Prize, providing $9 million in grants to support education, outreach, and technical operations related to the competition. In 2004, the Foundation made news when Burt Rutan, backed by Microsoft co-founder Paul Allen, built and flew the world’s first private vehicle to space to win the $10 million Ansari X PRIZE.